In these lessons, we will look at four basic rule of logarithms (or properties of logarithms) and how to apply them. You may want to also look at the proofs for these properties. 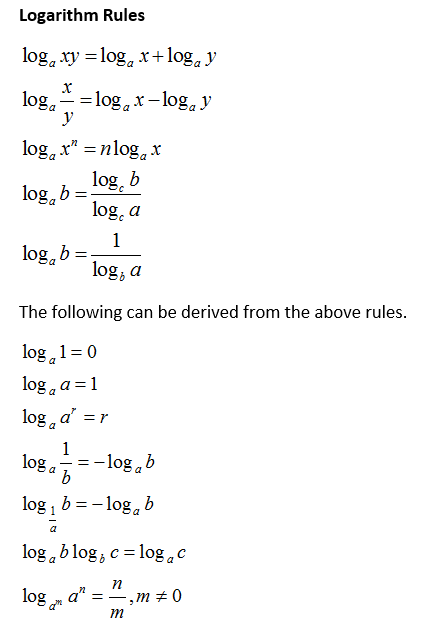 The following table gives a summary of the logarithm rules. Scroll down the page for more explanations and examples on how to use the rules to simplify and expand logarithmic expressions. 1. loga 1 = 0 since a0 = 1. 2. loga a = 1 since a1 = a. 3. loga ax = x since ax = ax. The video explains explains and applies various properties of logarithms. The main focus is how to apply the product, quotient, and power property of logarithms. Power Property: The log of a power equals the product of the power and the log. Examples on how to expand logarithmic expression and how to write expressions as a single logarithm. 1. Expand the logarithmic expression. 2. Write as a single logarithm. How to take an expression involving multiple logarithms and write it as an expression containing only a single logarithm?